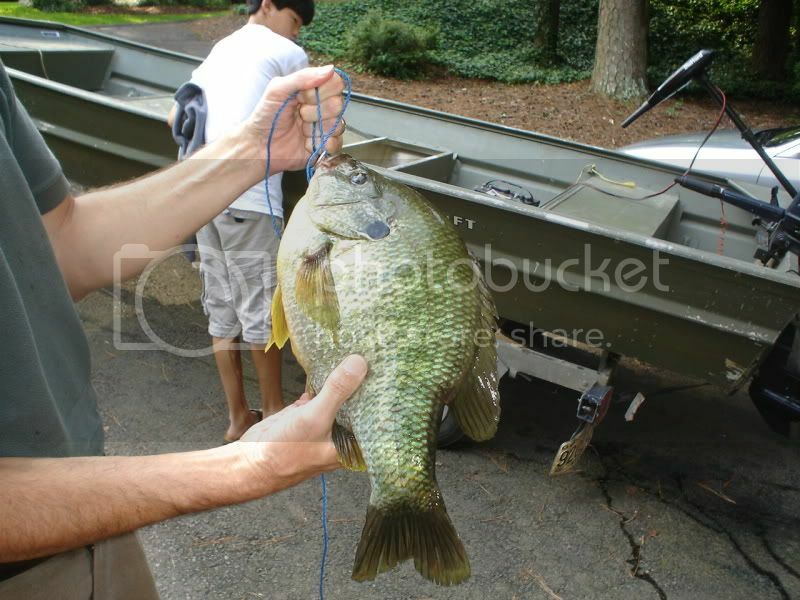 The state record for shellcracker or redear sunfish is an amzing 5 lbs 7 oz. This one from the Deepstep area of the Savannah River is missed by about 3 oz. Too bad it's not still in the water. Blackwater, I knew it wasn't your fish! Tar ths sad thing is that fisherman had three fish like that, I have seen pictures of the others. I have also seen those fish in the water where he caught them. Just curious, but what is the problem with keeping that fish? Is it that it's so close to the record? Not a matter of right or wrong, it's a matter of is it wise or not. If too many people keep too many big fish and all you will have is a bunch of small ones. Me, I like there to be a mix when I go fishing so many of us encourage folks to put the big ones back and if you want to eat a few, keep a few small ones. Heck, ask any DNR biologist. I bet he will say the same. Besides, them 10 to 12 inchers taste much better. I have seen trout streams where nothing but 5 inchers because the limit was 10 fish 7" or over. A waste of time to fish it. That is my story and I'm sticking to it and what it's worth and 50 cents still won't buy a cup of coffee! To catch a fish like that is really a fish of a lifetime. Sizewise it would not be the best eating, smaller ones easier to clean & cook and taste better most likely. If you want a trophy, you can take a picture and the measurements and have an excellent replica made that looks identical to the original. If the fish were then released, someone else could have the joy of catching it. We have documented that the same fish can be caught several times where C&R is practiced. Those are some reasons I personally would not keep that or any other trophy class fish. In the tourney we have on grorgiariverfishing.com one rule is that bass 3 lbs and over have to be released to be eligible for the tourney. You can eneter a bass 3 lbs and under and eat it. This year I have kept maybe 30 bass 3 lbs & under. When I catch one over three, like last year I caught maybe 20 river bass over 4lbs, I released them all. That's gotta be a Photoshop job! I thought the same thing when I saw the other picture swith three of them but then I checked the SC records on fish and the 5-7 caught from the diversion canal was bigger than these one scuaght from Deepstep so that made it believeable. One in one of the other pictures of which I do not have a copy looked bigger than this one. That and I check the details like I know some one who these fish in real life. Look at tha guys arm how the muscles & ligamnet are standing out as he hold the head of that fish up. That said to me he was feeling some weight. I can believe it. One of my wife's uncles caught a crappie years ago that weighed over 5 lbs. That's about 2 lbs heavier than the largest I ever caught and he was so impressed he had it mounted. A week after he got the mounted fish back he caught a 6 lb one near the same spot. It isn't just the joy of catching the fish again... genetics, moreso than longevity, are what creates those monsters and keeping it in the river ensures the genes of those large fish will be passed on to create other big fish. I have no problem with people keeping a few fish to eat - but I always release the super-size critters. I never keep any river fish anyway. I was just curious. In ponds I always let the bigger (3+) bass go and keep smaller ones if I'm trying to manage it. I'm mostly catch and release all around though. When I was in college I fished a pond that the state kept statistics on as a baseline for the reservoir management in East Texas. Approximately 5 acres, the pond was spring fed, deep in the middle but ringed with lillypads. Full of small bream, some nice size crappie and a few dink bass. But I routinely caught 6+ pound largemouth and the owner of the pond had told the state biologist about it and he asked to meet up with me. So I did. Turns out they'd never recorded any good size bass in there and had been dismayed by the stunted size of what fish they did catch. Spent a day with the biologist who introduced me to flyfishing on that very pond that very day. I fished baitcasting gear, mostly worms Texas rigged and as we circled the pond in a small jon boat the biologist caught a number of 3/4 lb crappie and small dink bream. Finally I caught a bass that weighed 6+ lbs and a couple of 1/4 lb bass too. Up until then I'd never caught a crappie in there and they'd never seen a bass over 1/2 lb. I attributed that to them not ever having shocked the pond and fishing with small poppers on flygear. He said he had only done that because it was so choked with lillypads that conventional gear had frustrated them. In a small environment a few large bass will keep the other fish in check. Once a few obtain any real size nothing else gets too big because they'll eat it to keep their competitors at bay. The biologist asked me and the owner to keep any bass over 3lbs to get them out of the pond. Told us by doing so more fish would be able to acheive larger size and in a few years there'd be a good population of larger fish before the attrition would finally settle back down to just a few largemouth and a bunch of dink everything else. Said it was just the natural evolution of small reservoir environments. Without mangement that's what ruins all of them, even ones with plenty nutrients and forage base as fisheries. So keep this in mind when tossing a hog back in a small pond. Rivers and large impoundments are another matter.